Have you ever walked into a meeting and been accused of dropping the ball or failing to complete a task which has caused issues for other people? Or maybe you’ve been the one who innocently asks a colleague why they didn’t get a task done? Or worse yet, the client calls in upset because something wasn't done that was promised! It easy to look at the situation and try to identify the problem. Why did this not happen? Whose responsibility was it to make sure the task was completed? But then, it happens...the discovery session turns into a finger pointing session. Bob didn’t get me the information I asked for 5 times and so I couldn’t do my part. If Bob would have given me the information I needed then I could have completed my task. It’s not my fault! I immediately hear the song Your Fault from Into The Woods. In this song, Jack says it’s not his fault because he gave the magic beans to the Baker in exchange for the cow. The Baker says that Jack lied about the Cow (which died) so the cow was oversold and therefore it is Jack’s fault. And if Jack hadn’t gone back to steal the gold they wouldn’t be in the situation. Then add in Little Red Riding Hood who says it’s Jack’s fault too. But the witch says it's the Baker’s father's fault for stealing the beans in the first place… The song goes on and on. We’ve all been in these situations. The finger pointing and more importantly the BLAME. At the conclusion of the song, the witch wisely states that it doesn’t matter whose fault it is. All that anyone is caring about is who takes the blame. The witch essentially says, blame me then. Obviously, this isn’t an ideal team environment. If we are all trying to cast blame then we aren’t worried about accountability. We’re worried about getting in trouble or being the one stuck with the blame. Defense Mechanism - this is a reaction to “save face” and avoid accepting your own faults. To Attack - Perhaps someone is trying to hurt another person and will cast blame to amplify the attack. Reject Root Causes - Sometimes we aren’t the best at identifying the real reason behind problems and so we quickly jump to the blame game because it’s easier than digging deep and making the situation, our co-workers, and ourselves better. Easier Than Accountability - It’s far easier to point a finger than to bear the weight of accepting our own faults. People Lie - Whether it is to “save face”, attack another, reject our own shortcomings, or wanting to take the easy way out, at the end of the day some people will lie just to avoid these difficult situations. So how do we switch from blame to accountability? In the end we have to turn the finger from the other person to ourselves in every situation. The leader is responsible at the end of every situation. The simple bad news is that we may be at fault. But even if we are not, we need to be strong enough to accept that we had something to do with every situation we’ve ever been involved in. A story from Grant Cardone in The 10X Rule: The Only Difference Between Success and Failure goes something like this. Even if we are rear ended by someone else while driving to work. We are still partially responsible. We chose the time we left the house and the route we took to the office. So even in situations where we are not technically “at fault” we still played a part in the transaction. But wait, you’re telling me that even if someone else hits ME that I’m still to blame?? Ah, the blame game starts all over again. Remember, we are concerned with accountability not blame. What I’m saying is that we have a part in every facet of our lives. And if we take ownership of our own involvement instead of casting blame to someone else we can begin to walk away from that game into the higher plane of accountability. 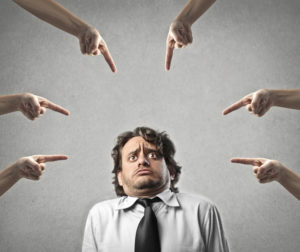 Accountability means that we accept our role and the power we have, and refuse, with stoic resolve, to give that responsibility to someone else through the act of blaming another. In the book, Leadership and Self-Deception: Getting Out of the Box , the Arbinger Institute talks about a guy named Bud and his time as a legal intern. It tells how a senior person in the company claimed responsibility for Bud’s mistake. She said, I am accountable for this work being done the best it can be and I forgot to ask if you checked the supplemental materials before I turned this in. I will accept the accountability. She could have easily pointed the finger to the young intern and how his mistake messed things up for everyone else. But she didn’t. I want to point out something VERY important about this. Not only did the woman in this story live up to her responsibility, but she created a loyal and devoted team member! Her actions displayed the epitome of leadership. She created a culture for the next generation of employees to live up to the reputation of someone like her and she inspired the young intern to work harder for her than ever before! See, blaming someone else might be a fast and easy answer and might help you save face...but what are the far reaching ramifications of that action? How do those around you respect and look up to you after you blame someone else? What do those people start to do when the finger is pointed at them? How does the culture start a downward spiral of blame and distrust and backstabbing after the blame game starts in an organization? At the end of the day. The boss is always going to look into someones eyes and ask, who is going to be accountable for a project or task being completed. We have the choice to step up and lead by example. Not only bearing the weight of that responsibility, but also in shouldering the weight of teach those around us what is means to be truly accountable. So, are you strong enough and willing to accept the responsibility of your commitments? And I might add, the commitments made of the team members who you lead? Remember, accountability doesn’t mean you are going to do everything yourself. It means that you are going to make sure everything gets done. Whether you delegate an assignment or do it yourself. You are willing to accept the responsibility of ensuring the task is completed. Not blaming. No excuses. Do you have what it takes to be accountable?